“what cookware should I use?” A common question I get. With all the available choices today in cookware, there seems to be many varying opinions as to which type of cookware is truly safe. As much as we emphasize on a clean diet, it is equally important to realize that the choice of cookware can also make a huge difference because they contain chemicals that can leach into the food. Here’s how the different kinds stack up. Let’s look at each of these. Glass is generally inert i.e non reactive and non-leaching and is impermeable to liquids and gases. This property makes it completely safe for food and drink usage . However, there are certain type of glass that have toxic lead or cadmium in them and can leach into food or drink. for eg: lead glass containers or lead crystal wares or glasses with glazes. Suggestion: SAFE, but avoid Lead glass and Lead crystal. These are categorized into traditional and advanced/technical. The traditional ceramics are mostly earthenware, pottery dishes and artistic creations. These are made up of Kaolin (clay), quartz, feldspar and cement. The advanced use aluminum oxides, silion carbide etc. Ceramics are usually chemical, heat, acid and corrosion resistant. Like glass, ceramics are generally inert and safe. One concern could be the glazes used on a ceramic, as there is the possibility of it containing toxic lead or cadmium. This is unlikely with ceramics made in Europe and North America for food use, but if unsure check with the manufacturer. As the name suggests, stainless steel should stain ‘less’ and not corrode (i.e., not rust). It should stain less, but it is not stain-proof. It is normally thought of as being corrosion-resistant. However, this depends on the grade and quality of the Steel . The base element is iron and to this Chromium is added which makes it corrosion resistant. Carbon is further added in small amounts to increase its strength and hardness. Nickel is /maybe added to stabilize this structure and to increase integrity to high temperature extremes and corrosion resistance. Other metals that are added include molybdenum and titanium. Stainless Steel Grades: Food grade stainless steel are in the 304 Series. They are designated as either 18-8 or 18-10. The ’18’ refers to the percentage of chromium in the stainless steel, and the ‘8’ or ’10’ the percentage of nickel. Both are high quality stainless steels. The chromium and nickel are what make stainless steel corrosion-resistant, increased strength, durability. Nickel gives the temperature resistance. Stainless steel grades with very little nickel do exist (e.g., grade 430) and cost less, but they are considered lower quality because of their decreased corrosion- and temperature-resistance. Similarly, there are other grades with low nickel content (e.g., grades 201 & 202), in which the nickel is replaced by more manganese. Manganese is significantly less expensive than nickel, but the resulting stainless steel may be slightly more susceptible to corrosion in certain circumstances and may have a slightly inferior surface appearance. The nickel content also may be increased, creating a slightly higher grade stainless steel. For example, grades 316 and 317 may have 10-15% nickel content and include molybdenum, the combination of which increases resistance to specific forms of corrosion in extreme environments. Safety: Common food grade stainless steel (18-8 or 18-10, 300 series) can release trace amounts of certain elements – but the higher the quality of the stainless steel, the less the leaching. There are four key possibilities for release from 300 grade stainless steel: iron, chromium, manganese and nickel. 1. Iron: Majority of the population need iron and the amounts released do not cause toxicity. In very high iron overload individuals, it is best to alternate with other options. 2. Chromium:like iron, can also be positive for human health in small doses. The safe intake range is around 50 to 200 micrograms per day and 1 meal prepared from them might release 45 micrograms of Chromium, which is well within safe levels. Even eating with stainless steel dishes several times a day is fine, as less chromium is released from just eating off the dishes compared with cooking in them using heat. Remember, that if the stainless steel is of high quality it will be stable and very little if any will be released. And any releases through normal wear and tear of high quality stainless steel should be miniscule at most. Stainless steel does not contain hexavalent chromium, which is a highly toxic carcinogen. 3. Manganese: The uptake of manganese by humans mainly takes place through food, such as spinach, tea and herbs. As such, the trace amounts leached amount from wear and tear is miniscule and equals the amounts taken through food on daily basis. 4.Nickel: is not toxic in small amounts, but it can provoke a reaction in people with allergies or sensitivities to nickel. Small amounts of nickel can be transferred from stainless steel containers or cookware to foods – especially when the food in question is acidic (e.g., tomatoes, rhubarb). may have an allergy to nickel or show high nickel amounts through tests, choose the less nickel content grade of steel or avoid completely. Suggestion: SAFE material for use in everyday life, including for items such as food containers, dishes, cookware, utensils, water bottles and dispensers. If you have a nickel allergy, avoid stainless steel, or try only 200 grade (nickel-free) stainless steel. There is increasing evidence and testimonials about the prevalence and dangers of aluminum poisoning. There are documented adverse human health effects that can result from aluminum exposure including -Neurotoxicity, Alzheimers,, Breast cancer and mitochondrial dysfunction. Annodysed aluminum have become a popular alternative. The anodizing process “locks in” the aluminum, but anodization can break down over time. Suggestion: Avoid all aluminum cookware including anodized aluminum ones. Cast iron is essentially pure iron that has been heated and then poured into a mold to create a particular form. Carbon and silicone are key alloying elements that are added to the pure iron to increase its strength and malleability. Cast iron cookware will release iron into the food being prepared, but this is not necessarily a bad thing (only if you have an iron allergy or suffer from iron overload. In fact, the use of cast iron cookware is considered a safe way to maintain and increase ones dietary iron intake, and is even considered a way of reducing iron deficiency. The amount of iron released from cast iron cookware will depend on the food, its acidity and water content, how long it was cooked and how old the cookware is. More will be released from newer cookware used to cook acidic food (apples, tomato sauces or Indian dishes). If you use an enameled cast iron, choose the ones with good quality enamel. (Le cruset or Staub brands). For cast iron, I personally prefer old vintage ones from 50’s as the nickel content is relatively much lower. Suggestion: SAFE and long lasting. Copper is an essential element for many enzyme reactions – and thus necessary for the body at low levels as a dietary mineral contributing to good health. If you have copper water pipes and your water is soft (as in Singapore) (tending toward acidity) then substantial copper may be leaching from the pipes into the water through corrosion. One way to overcome this is to simply let the water run for a bit (15-30 seconds) in the morning to pass through the water that has been sitting in the pipes (and brass fixtures if you have them) all night. Exposure to excess copper can also occur with the use of uncoated copper cookware especially with acidic food that is directly in contact with the copper. 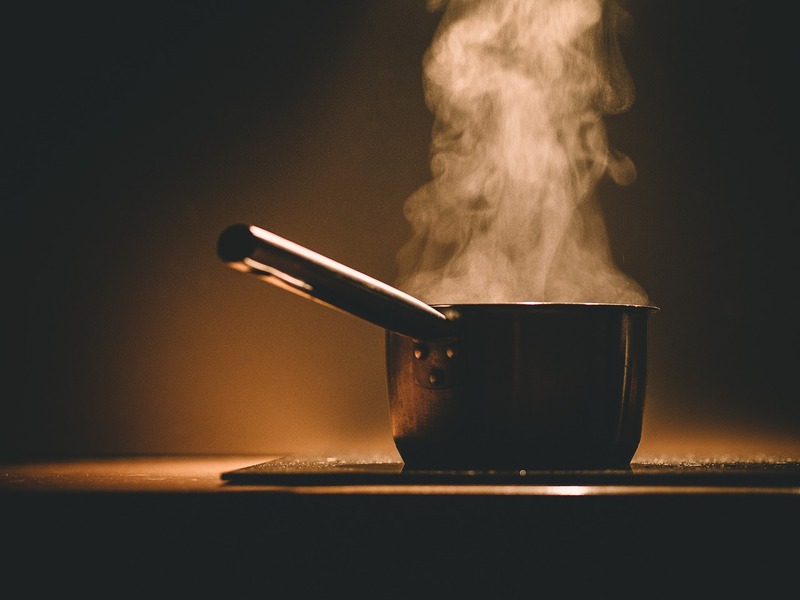 Most copper cookware is coated with another metal, but this protective layer can degrade over time when used extensively with acidic food and/or scoured with, for example, steel wool. Suggestion: SAFE, but take precautions. Best, to avoid as copper coating tend to degrade over time leading to more exposure. Considered SAFE to use. But, we do not have enough information yet. Avoid these as they contain Lead and other toxins that are harmful. Ditch them. UNSAFE to use. Most nonstick cookware are aluminum coated with polytetrafluoroetheylene (PTFE), which is a known toxic. nickel, chromium, and iron. Arch Environ Contam Toxicol. 1992 Aug;23(2):211-5. 4. Haudrechy P, Mantout B, Frappaz A, Rousseau D, Chabeau G, Faure M, Claudy A.
Nickel release from stainless steels. Contact Dermatitis. 1997 Sep;37(3):113-7.
health risk in developing countries. Sci Total Environ. 2017 Feb 1;579:805-813. 7. Shankar A, Xiao J, Ducatman A. Perfluorooctanoic acid and cardiovascular disease in US adults. Arch Intern Med. 2012 Oct 8;172(18):1397-403.
best safest cookware guide ever. really amazing blog. sir you can also add the question ” Which Is Safe Cookware And Non-Poisonous?” and answer. that will be more helfull. Hey,you are sharing nice information about cookware. i discuss about ceramic cookware in my blog . you can check this.